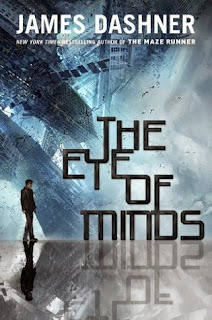 David Powers King: Releases: The Eye of Minds and The House of Hades! Releases: The Eye of Minds and The House of Hades! Hey, guys! I hope your weekend was eventful and stellar! I'm not going to lie - I had mixed emotions going into this week. You might remember that I had planned to celebrate the release of Woven on the 8th of this month, but ... we all know that plan went by the starboard side ... for the time being. However, there are two power- house novels releasing this week. Seriously, like I'd stand a chance competing with these two juggernauts (which I preordered months ago)! Here's some exciting new sci-fi/fantasy books this week! First is the start of a new sci-fi series by the great James Dashner! Up next is book 4 of The Heroes of Olympus by Rick Riordan! Updates: I've been making some good progress on The Undead Road. As you can see on the progress bar, 15K to go! My awesome critique group did point out a major hole that my planned outline hadn't counted on, so I had to go back and do a whole chapter rewrite and make the following chapters fit the new direction, but it's good to catch this at chapter 18 instead of chapter 3, amiright? This is going to be a long-overdue review kind of week, so be sure to check out what I have in store later on this week. See you then! I'm David, and Number 5 is alive! Congratulations to Rick and James. Glad you found that hole and were able to fill it. Congratulations to your two authors you reviewed, I have been saying all day what a wealth of talents there are in authors blogging. I bet this was a hard week. But I'm hoping you'll have good news to share soon. I'm looking forward to James Dasher's new series. Dashner's book definitely has me on the edge of my seat. Congrats on your progress and critique groups rock. Woven will find a home, chin up David. More good books for my reading list! Your book will be a smash when it finally comes out! LOL, #5 is alive. Dashner's book does look good. I feel bad for Woven today but greater things are coming. The only reason these books are powerhouses is because they got the right marketing to be powerhouses. Your book sounds equally as incredible as what these two come up with. Now that you are agented, I expect David Powers King to become a powerhouse. Isn't that what you want? It shall happen good sir. Only the difference here is that I know you. I can say, DPK and I had dinner together! I still have yet to get into Rick Riordan, but my wife loves his work. And Ghostbuster the game, sweet! Ha! I was thinking of Short Circuit the other day while my kids were watching Wall-E. I really liked Maze Runner but the rest of the series didn't do it for me. Still, I'll give this one a chance. Exciting! I wish them the best luck! Those look like amazing books. I'm esp. interested in The Eye of The Minds. Yay for crit groups to help you recognize holes and fix them sooner rather than later. You can do it! Awesome books--I definitely need to grab a copy of The Eye of the Minds. Best of luck with writing and plot holes! My older daughter is super excited for House of Hades. She loves Riordan's books. I love the series, and this book is just astounding! Another great book from Rick Riordan, and I think it could not have been any better.